When a driver retires from a race it’s usually incredibly dramatic, but the ways in which they retire can often be pretty boring. But in the the past the have been quite a few times when something incredibly extraordinary has put a driver out of action. Here are ten of the strangest. The inaugural Singapore Grand Prix was a very chaotic weekend. Mark Webber was going well and on course for a podium when the gearbox of his Red Bull RB4 tried to select two gears at once, and he was out. That sounds fairly ordinary, but the reason for the failure came from some mysterious electronic interference thought to come from the area of the circuit around the Anderson bridge. 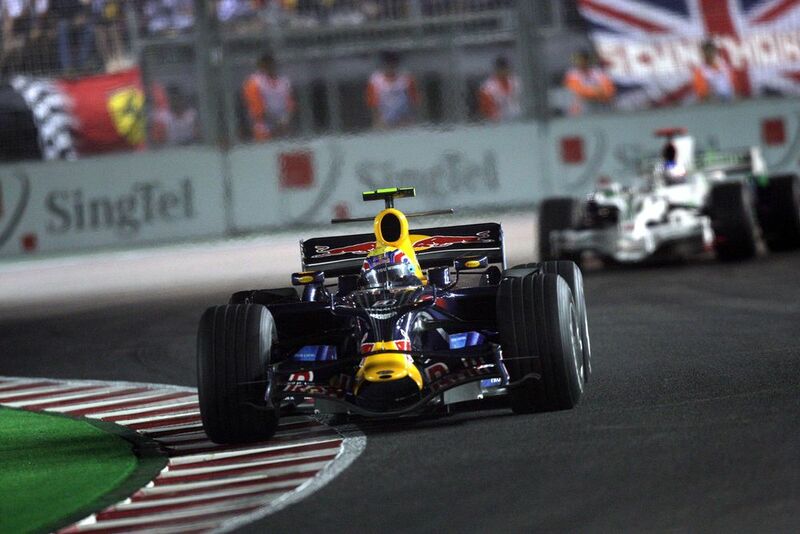 It affected some other drivers during that weekend but Webber was the only one to suffer during the race. The following year the team added some extra protection against the interference but despite the slim chances of it causing a failure, it’s still something that teams worry about. The active suspension systems of the late 80s and early 90s helped F1 cars achieve some serious speeds, but they weren’t foolproof, and a number of failures led (among other things) to the systems being banned for the following season. This was perfectly illustrated during the 1993 Portuguese Grand Prix at Estoril, when Gerhard Berger’s Ferrari F93 slammed into the wall following a pit stop. Initially it looked like simple driver error, but it turns out that the bumpy surface confused the supposedly clever suspension system, and it ‘forgot’ where it was on the circuit! This caused the car to bottom out, leaving Berger a passenger as he speared across the path of oncoming cars. 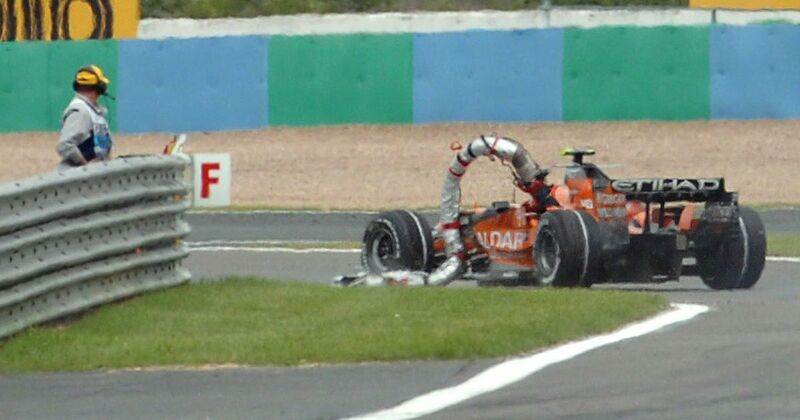 It’s not the only refuelling problem we’ve seen in F1, but it is one of the most bizarre. During a pit stop, Christijan Albers decided that he wanted to get back in the race, so ignored his lollipop man and took off the moment his car had dropped off the jacks. Unfortunately his car was still being topped up with fuel, and Albers ripped the hose right out of the refuelling rig and carried on out of the pit lane. He brought his car to a stop but was out of the race. When Johnny Herbert crashed out at the second Lesmo during the 1998 Italian Grand Prix it looked like a simple driver error. But actually Johnny had nothing to do with his early retirement. It turns out that a forgetful Sauber mechanic had left a spanner in the cockpit. Oops! Eventually it had worked its way under the pedals and so when Herbert went for the brakes the pedal couldn’t move properly, sending him off the circuit and out of the race. A mechanic leaving a spanner in the cockpit is one thing, but leaving an entire radiator bung in the sidepod is quite another. 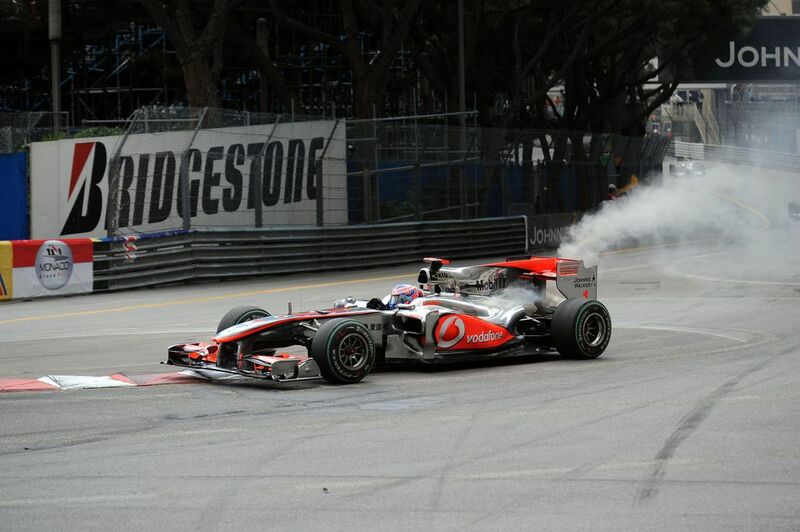 Unfortunately for Jenson Button that’s exactly what happened at Monaco in 2010, and by the time McLaren had noticed it was too late - Button’s engine overheated behind the safety car and he was out of the race. When Damon Hill took Michael Schumacher out at Monza in 1995 it set the stage for Ferrari to take a 1-2 on home ground. Jean Alesi was leading Gerhard Berger when one of the onboard cameras on Alesi’s car flew off - and straight into his team mate. The camera smashed into the suspension on Berger’s Ferrari, putting him out of the race instantly. Ferrari didn’t even get to enjoy victory as just a few laps from the end a wheel bearing put Alesi out of the race as well. Talk about bad luck! A race isn’t over until you’ve crossed the line! Nigel Mansell found this out in one of the worst ways possible at Montreal in 1991, when his Williams gave up with just a few corners to go. 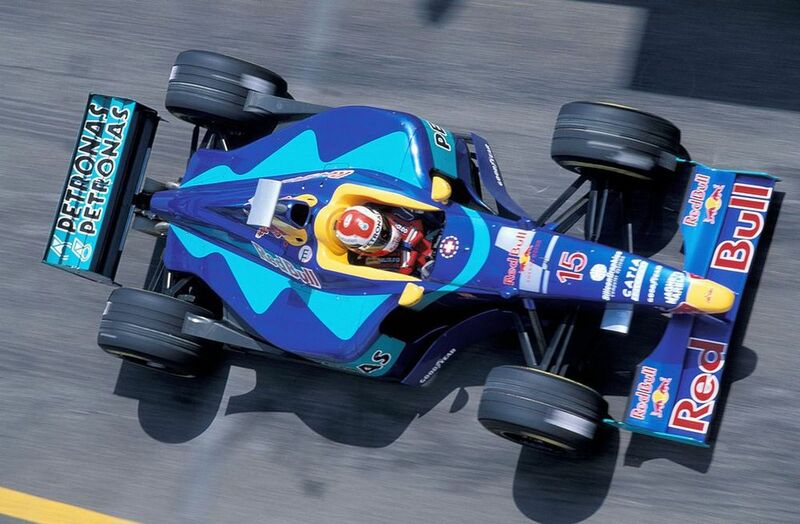 Mansell had dominated the race and led every lap, but at the hairpin on the last lap his Williams ground to a halt. He’d already spent much of the last lap celebrating and waving to the crowd, but in doing so allowed the revs to drop so low that the car stalled. 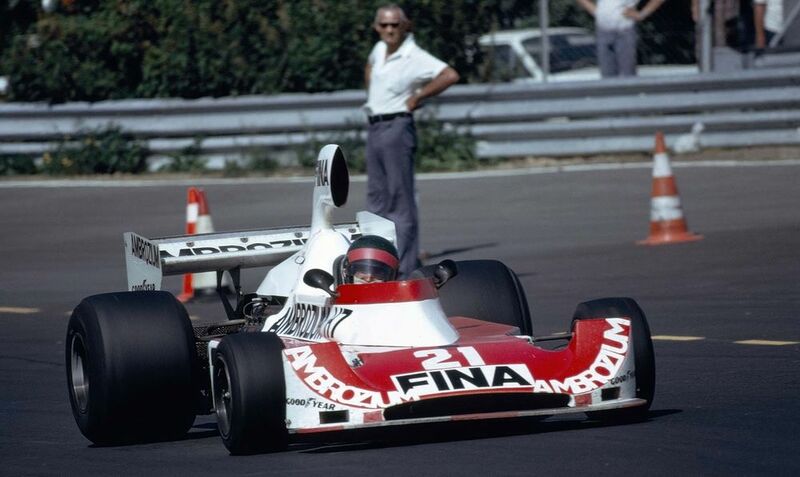 To make matters worse it was his arch nemesis Nelson Piquet who inherited what would be his last F1 victory. Piquet didn’t care about the lucky nature of the win though, saying he “almost came” when he saw Mansell stopped at the side of the track. How did no one notice a car that wasn't meant to be in the race?! 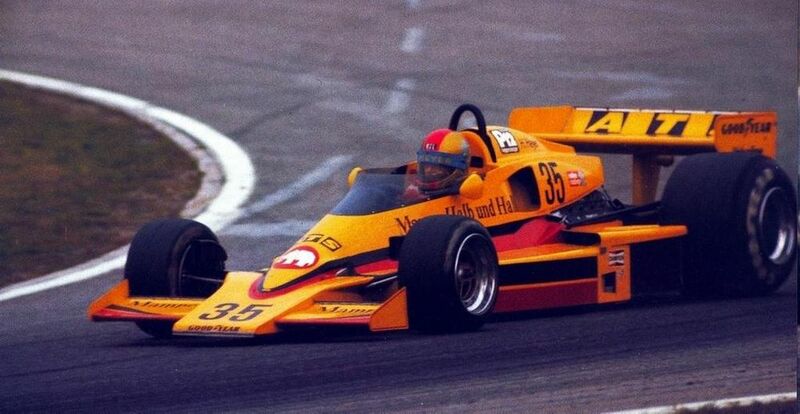 Hans Heyer didn’t qualify for what would have been his only Grand Prix, but in some confusion at the start of the race he slipped out of the pits and on to the grid - but no one noticed! In fact it wasn’t until his gearbox broke a few laps in that officials realised he shouldn’t have been in the race at all, at which point he was disqualified. Failing to finish a race he didn’t qualify for and which he didn’t officially start - that’s the quite the achievement! Nelson Piquet Jr. joined the likes of Ayrton Senna and Michael Schumacher during the 2008 Singapore Grand Prix when he deliberately crashed at Renault. Only unlike Senna and Schumacher he didn’t do it in a selfish attempt to win a championship, oh no - he did it so that 1) the team wouldn’t fire him at the end of the year and 2) the ensuing safety car would put team mate Fernando Alonso on the perfect strategy, allowing him to win the race. Despite everything working out as planned Piquet was dropped from the team halfway through 2009, at which point he came clean about the whole thing and ‘Crashgate’ became one of the biggest scandals in the history of the sport. Ok, so this one is technically a DNS rather than a race retirement, but it’s too funny not to include. In preparation for the 1975 United States Grand Prix at Watkins Glen he went to apply some eye drops but picked up the wrong bottle. Instead of getting nice, soothing eye drops he actually picked up his visor cleaning fluid and squirted it straight into his eyes. Unsurprisingly the resulting burning sensation affected his vision so badly that he wasn’t able to take the start of the race. What are some of your favourite bizarre reasons for retirements? Let us know in the comments!